Instead of struggling for hours trying to change the string on your lawn trimmer our team put together a detailed 8 step guide! 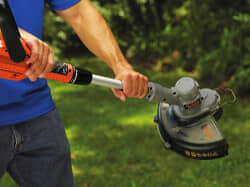 We reviewed changing trimmer line for many of the top brands like Ryobi, Echo, Troy Bilt, Husqvarna and Homelite so you can get back to working on your lawn. Ready to get started changing your string? First check if your model has one string or two string (single or double hole) then follow these 6 steps and you will be back in business! Still need a little more guidance – check out the FAQ’s. 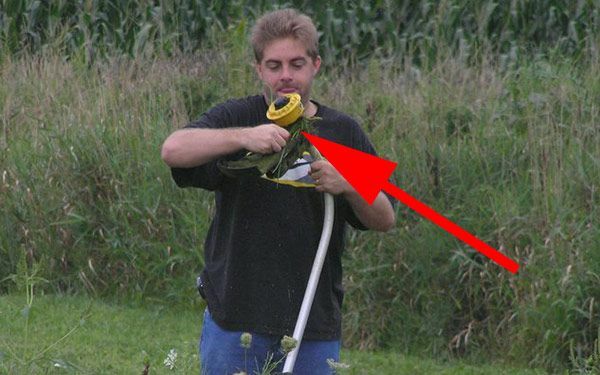 Reading the manual seem obvious, but if you’re using a new weed whacker, you may assume you know what you’re doing right off the bat and be all wrong. For example, with some of the newest models, you just buy a new spool, However, the user manual is also where you’ll find the specific kind of string you need for your model. This refers to the size, but there may be other specifications outlined as well. Do not go trying to make do with a different size or type of string. 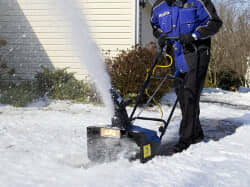 This would be a great way to make your next trip to the home and garden store one for a new weed whacker. Generally, the most common sizes for gas-powered models are .080 and .095. Electric weed whackers tend to use .065. Again, though, consult your manual to confirm. To begin, either turn to unscrew the spool or push in the tabs in order to release it. On some models, you may actually need to remove the head of the trimmer from the rest of the body before you’re able to release its spool. In order to do this, you’ll need to remove the nuts that hold it in place and screw them back in upon completion (so keep an eye on them). 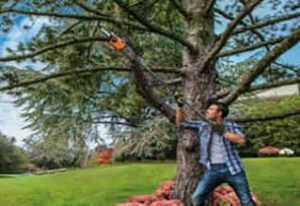 Now, turn to your new string and cut a swath that’s somewhere between 15 and 25 feet, depending on its size. When in doubt, go longer as you can always modify it again later. If your machine uses 2 pieces of string at the same time make sure they are the same size for an even cut. Next, find the small hole that’s located in the center of the spool. Proceed to push through about a half-inch of the string. You want the hole to grab onto the string so you can then load the rest of the spool. If you have two strings, there will be two holes. Do one at a time. There will be an arrow showing you which way to wind. Wind it from side to side and then, when you need to form a second layer, begin overlapping. This will keep your string from tangling. Once you have it wound, clip the string into the notch found at the edge of your spool. Then replace the spool back into the hub and pull the ends through the machine’s eyelets. You should now be able to turn on your machine and clear weeds and grass. Most Echo models use Speed Feed bump line. Loading is easy and can be done in just a few minutes. Follow these 3 easy steps and you will be back to work in no time! Ryobi models are heavy duty – usually used on large lawns or for commercial work. Being able to restring quickly is important if you don’t want to spend all day on the yard. Still not sure how to change the line – check out these frequently asked questions! Every string will damage a wood fence. The key is cutting a straight down your fence line – about an 1 or 2 inches away to prevent unsightly cut marks. My string will not pull - what now? Is your cutting string stuck and won’t pull out? Try pushing it in at a different angle and wiggling it around. If that does not work try to clear the interior of the unit with a can of compressed air.